The outage affected government computers and prevented Judge Leslie Jackson from accessing some of the files he needed. Breau and Francis have been in custody since the clash between police and protesters October 17. Lawyer Alison Menard represents both Breau and Francis. She said this case has been difficult for her clients. “Every time there’s a delay, even a 24-hour delay, is a long period of time for somebody’s who in a remand situation so it really does cause a lot of difficulties,” she said. The trial has been on and off since it started in March. Both Breau and Francis have already pleaded guilty to some charges, but the trial centred on more serious charges to which they both pleaded not guilty. Twenty police officers took the stand during the trail. Several testified they saw Breau with a gun. There was also testimony about molotov cocktails being thrown. One officer said one of the cocktails landed so close to him he could feel the heat. Final arguments were heard on May 15. When the trial wrapped up, Judge Leslie Jackson said he would need time to go through all of the evidence, including videotapes taken that morning in Rexton. The judge will be back in court to deliver his verdict June 26. 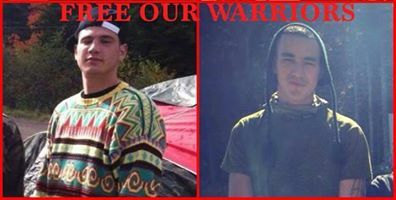 Posted on June 22, 2014, in Oil & Gas and tagged Aaron Francis, anti-fracking New Brunswick, Germain “Junior” Breau, Indigenous resistance, Mi’kmaq, Mi’kmaq Warrior Society, native blockades, native resistance, New Brunswick shale gas protests, SWN Resources Canada. Bookmark the permalink. Leave a comment.